We do not use power equipment to install our systems. We hand dig all areas and lay pipe manually to protect all living things in your yard. By using this method you will be assured of a proper installation. Pulling pipe with machinery can rip tree roots and stretch the polyethylene pipe beyond it's limits. For taps, manifolds, and backflow preventors, we only use copper plumbing. No PVC is ever used. The polyethylene pipe is NSF approved 160 PSI for all pressure line use. I believe Rainbird and Hunter make the best heads and timers, so we use them. 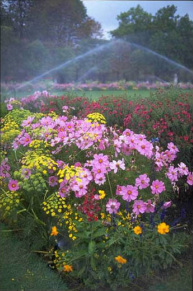 We are competitively priced with other sprinkler companies. We warrant all labor for one year and maintain all manufacturers guarantees. I personally work on every installation and repair to assure the highest quality throughout.